This article will show how to authorize your BIAS software using the Authorization Manager. You will need to have your computer connected to the internet. If the computer you are using your BIAS software on is not connected to the internet you will need to use the Web-based Alternate Authorization method to register and authorize your BIAS software. Launch the application/Instantiate the plug-in — you will be presented with the following dialog. Click "Authorize" — the BIAS Authorization Manager will appear. Select the product you wish to authorize. Enter your serial number in the serial number field — if the serial number was emailed to you, you can Copy/Paste and the formatting will be correct. Enter email address in the email address field (Please be sure to use the same address that was used when registering other BIAS software). 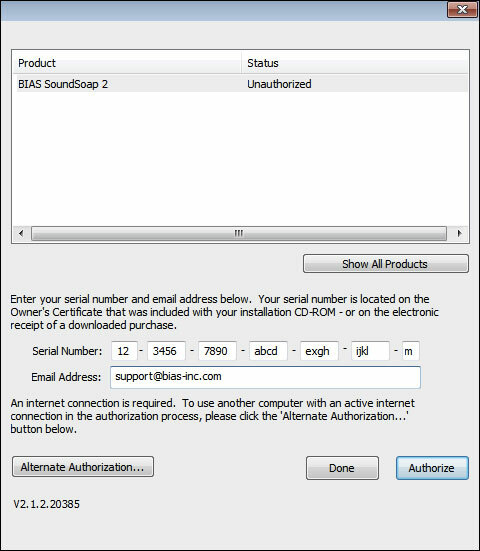 If you have previously registered another BIAS product using the same email address, your software will be authorized automatically — a dialog will appear indicating that you have been successfully authorized. If the BIAS Registration system does not recognize your email address (i.e., if this is the first BIAS product you are registering, or if you enter a different email address than with previously registered BIAS products) — a dialog will appear, prompting you to enter your registration information. Enter your registration information, and click the Submit button — a dialog will appear indicating that you have been successfully registered.